The large James Bond stage at Pinewood Studios in Buckinghamshire has been destroyed by fire. At least eight fire engines tackled the blaze at the set, where filming for the new movie Casino Royale had finished. 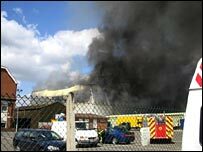 Eyewitness Jen McVean, who owns a firm at the studios in Iver Heath, said the stage had been "completely on fire". The stage had been transformed into a replica Venice where the film, with a reported budget of £39m ($72m), is partly based. The roof covering the stage caved in through fire damage and firefighters used special equipment to reach it. Brian Dugdale, the firefighter in charge of controlling the blaze, said: "Luckily the stage was just being disassembled after a shoot and there weren't any of the hazards that you would normally associate with filming - there weren't any pyrotechnics or anything like that. "There were a number of welding kits on the stage that were being used by some engineers and one of the elements of the welding kit is an acetylene cylinder and that is still alight and so we're dealing with that. "It will probably take us 24 hours to resolve that problem." A spokeswoman for the Buckinghamshire Fire Brigade said it had been alerted at 1118 BST on Sunday. A spokesman for Pinewood Shepperton said: "We do not know the extent of the damage to the 007 stage, although it is believed to be significant. "Filming was not taking place. A production had completed filming and its film sets were in the process of being removed." Pinewood - which began life in 1935 - has a long association with the Bond films, starting with the first movie Dr No in 1962. It merged with Shepperton Studios in 2001 and attracts a range of films of varying budgets. Together with Ealing, the three studios have formed the backbone of the British film industry for 70 years. It took more than a year for a replacement stage to be rebuilt at Pinewood following a fire in 1984. It reopened in January 1985 as the Albert Broccoli 007 Stage, in honour of the producer of many Bond movies. The original stage was first created in the late 1970s during the filming of The Spy Who Loved Me and was created when the script called for filming of two submarines inside an oil tanker. The stage was built complete with an enormous water tank. Other Bond scenes filmed around the studio include a car chase in Goldfinger's factory, and Spectre island in From Russia With Love. 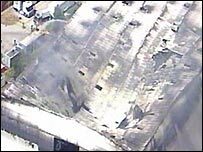 Pinewood was hit again in 1997, when a fire broke out in the roof of a sound building where The Avengers was being filmed. Were you in the area? Could you see the blaze? Send us your pictures and video using the forms below.